Who Will Cry When You Die? 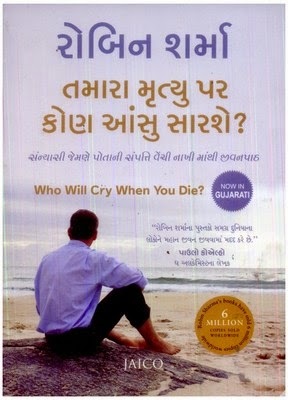 (Gujarati) is another book of solutions to some of life’s problems by the author of The Monk Who Sold His Ferrari, Robin Sharma. In Who Will Cry When You Die? (Gujarati), Robin Sharma lists no less than 101 points to follow for a more enriched life. Written in simple language, it lists the dos and don'ts that call upon a great deal of self-discipline. It talks about life lessons that one can apply to realize their full potential. He suggests tracking our everyday activities to make sure we do things that are constructive and have positive effects on other people as well. The author also suggests contributing constructively to society in the process. Unlike The Monk Who Sold His Ferrari, this book does not have a story weaved into the message and neither does it sound preachy. It is a good book to read if one is looking to introspect and find a higher purpose in life and it aims at helping readers in staying focused on being happy. According to Sharma, one way to do this would be to live life by choice and not let things happen by chance. He quotes Norman Cousins and his father among others for emphasis. The book also focuses on how one can accept one's responsibilities and how to look for contentment. One of his suggestions is to take a “worry break”, an allotted time everyday just to think about our problems and that eventually, we would decrease the time allotted for such breaks until the habit is done away with. Who Will Cry When You Die? (Gujarati), following the success of the The Monk Who Sold His Ferrari, was also a success. This book is the Gujarati version of the original book published in 2007. Robin Sharma is a Canadian lawyer, author and leadership expert whose best known work is the The Monk Who Sold His Ferrari. He has written 15 books so far. Noteworthy publications of Sharma include Family Wisdom From The Monk Who Sold His Ferrari, Leadership Wisdom From The Monk Who Sold His Ferrari, MegaLiving!, The Leader Who Had No Title, The Gandhi Factor, The Saint, The Surfer And The CEO: A Remarkable Story About Living Your Heart’s Desires, and Begin Within. Sharma holds an LLB from Dalhousie University School of Law and worked for the Supreme Court of Nova Scotia as a judicial law clerk. He also founded the Sharma Leadership International Inc. in Toronto, Canada. He was presented with the Golden Gavel Award and was listed 7th on the International Leadership Professional Gurus list.